The Grant Ranch is made-up of 1390 homes which are organized into sub-areas within the community. Each sub-area has its own unique home characteristics from low maintenance gated patio homes to 2-story homes with a family friendly neighborhood feel. Homes in Grant Ranch were built between 1997 through 2000 by several different builders. In the subdivision you will find mostly 2 story homes with a few ranch that sit on a tenth to half acre lots. The floor plans of homes in Grant Ranch are diverse ranging from 2,000 to 6,000 square feet with basements and 2-3 car attached garages. One of the reasons this subdivision is sought after is because the Grant Ranch HOA which provides ample amenities for residents including a clubhouse, community pool, tennis courts, grounds maintenance, snow removal, and trash pickup. Homes in Grant Ranch are located near three lakes, Marston Lake, Bowles Reservoir, and Bowles Lake in the heart of Littleton Colorado. 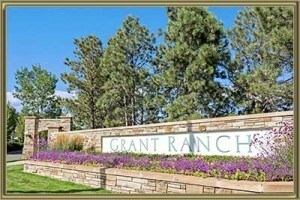 Our Grant Ranch real estate agent can schedule a tour of homes in the area by calling 303-325-5690. Belmont Shores is one of the smallest area in Grant Ranch with 45 ranch and two-story homes available. The homes were built between 1997 & 1999 by Larsen homes. The floor plans are 3000-3600 finished square feet and include an attached 2-3 car garage. This is one of two luxury areas of Grant Ranch, the other being Hillsboro. The Belvedere sub-area are mostly 2-story with a few ranch styles that include spacious floor plans of 6,800 to 10,000 square feet of living space and about half include walk-out basements. The homes sit on a third to half acre lots that provide ample privacy. They were built by Summit Chalet from 1998-2000. This is the most affordable area of Grant Ranch. It is also a diverse area with home styles mostly being 2-story with a multi-level. Floor plans include 1500-2500 square feet and 2-3 car garages. Homes were built between 1998-1999 by D.R. Horton, Inc.
Crossings is the largest sub-area with 138 homes that range from 2200-4000 square feet including a basement. The were built in the late 1990's by Richmond American Homes. These 2-story homes sit on lot sizes of 6400-9000 square feet and include an attached 2-3 car garage. Dorado Greens is one of two patio home sub-areas in Grant Ranch that were built by Larsen Homes between 1998-2000. It is a gated neighborhood with mostly ranch styles and a few 2-story homes that include 2,000 to 3,700 finished square feet. All homes include a basement and 2-3 car attached garage. Eagle Ridge is the only townhome complex in Grant Ranch. The townhomes average 1,200 to 3,000 finished square feet with most having a basement. The 53 townhomes were built in 1997 & 1998 and include a 2 car attached garage. A patio home sub-area with 53 homes built by Metropolitan Homes in the late 1990's. These ranch and 2-story patio homes are low maintenance with lot sizes of 4800-6800 square feet. Inside floor plans range from 1,600-1,900 above ground square feet plus they all include additional space in the basement. 59 ranch and two-story homes make up the Heron Estates sub-area. Floor plans range from 3,000 to 4,700 square feet and most include a walk-out basement and 3 car garage. Genesee Builders built the homes in the late 1990's. All homes in Heron Shores are ranch style with 1,800 to 3,500 square feet which includes a large basement. Some of the home back to Bowles Reservoir and most of the basements are walk-out style. These home built between 1998 & 1999 by Genesee Builders also include a 3 car attached garage. These semi-custom homes were built between 1997-2002. Home are 2-story with a few ranch that include generous floor plans of 3,800 to 6,000 square feet of living space. The spacious quarter and half acre lots provide room between neighbors and the 3 car attached garages provide ample storage space. It is also the smallest sub-area with 41 homes. The Images sub-area includes 86 homes built by D.R. Horton, Inc between 1996-1998. Home styles are mostly 2-story with a few ranch that include 1,900 to 2,300 above square feet, plus they all include a basement and 2-3 car attached garage. Lot sizes vary from 6,000 to 8,000 square feet. The most north sub-area of Grant Ranch that backs up to Marston Lake includes 59 homes developed by Watt Homes in the late 1990's. Floor plans range from 1500 - 2800 square feet and include 2-story, ranch, and multi-level style of homes with 2-3 car attached garages. Shae Homes built up the Park Place sub-area from 1997-1998, which includes all 2-story homes with 1800-3200 finished square feet including a basement and 2 car garage. The 80 homes sit on a tenth to quarter acre lots. Poppy Hills is a gated patio home community directly across the street from the neighborhood clubhouse, pool, tennis courts, marina and lake. The sub-area is made up of 89 homes built by Metropolitan Homes in 1998 & 1999. There are mostly ranch style patio homes with a few 2-story that range from 1,500 to 3,000 square feet. The low maintenance yards are 4,300 to 6,600 square feet. Many homes in the Promenade area back to the Raccoon Creek Golf Course. They have spacious quarter acre lots and the floor plans of these 2-story homes span from 3,200 to 5,000 finished square feet. All the homes have a basement and 3 car garage. This sub-area was built by Shae Homes in 1999 & 2000. Similar to many of the other neighborhoods, Reflections was built by D.R. Horton, Inc in the late 1990's. Homes sit on 5,500 to 7,000 square foot lots. You will find both ranch and 2-story homes in this area and the floor plans vary from 1,900 to 3,500 finished square feet which include a basement and 2-3 car attached garage. Regatta backs to Bowles Reservoir and the homes sit on large quarter acre lots. This is the only sub-area in Grant Ranch built by Infinity homes from 1999 - 2002. There are mostly two-story styles with a few ranch that include 2,800 to 5,200 finished square feet which also includes a basement. All the homes have 2-3 car garages. Built by Shea Homes from 1999-2001, these mostly 2 story with a few ranch back to the Raccoon Creek Golf Course. Floor plans average 2,400 to 4,400 finished square feet with 3 car garages. Lot sizes range from 7,000 to 9,500 square feet. 83 homes developed by D.R. Horton, Inc make up the Tapestry sub-area in Grant Ranch. All the homes are two story with 3,000 to 4,700 square feet of living space that include a basement and 3 car attached garage. They are walking distance to several local parks. An affordable sub-area within Grant Ranch with 79 homes built by Watt Homes in 1998 & 1999. This sub-area is located directly across from Blue Heron Elementary school and Sunset Park. The home styles are a mixture of 2-story, ranch, and multi-level homes with 1,800 to 3,000 square feet which include a basement, and some are walk-out style. The homes sit on 6,900 to 9,000 square foot lots. See what your home is worth With an Instant Home Valuation Online. Want advice on selling your house? We provide a free staging consultation, pre-listing prep plan, and a Grant Ranch real estate market analysis. Call us at 303-325-5690 to learn more. New to the Area? Call our Grant Ranch real estate agent at 303-325-5690 to schedule your tour of Homes in Littleton CO.
Click on the map pins to see each of the sub-areas for homes, condos and townhomes in the Grant Ranch Subdivision. Each pin has a link to our detailed sub-area page to learn all about the neighborhood, community and see all listings for sale.